Pharrell Wu began doing math at age one and was trading stocks at age three. Living in the Philippines, Wu became bored with the math curriculum at his school and started Googling for hard math problems on the one computer his parents owned at home. He came upon Brilliant.org, a recently launched online community that challenges and brings together technical minds to solve math and analytics problems, and started completing problems. Brilliant’s founder, Sue Khim, saw that Wu was crushing college students in some of the math exams and immediately matched the young boy with a mathematics professor from the University of Michigan for private tutoring sessions to study undergraduate level linear algebra. According to his now mentor, Wu is already at the level of an exceptional undergraduate math major, and is scoring better on tests than almost all of the professor’s college students. There are brilliant technical minds like Wu across the world, and the Internet is bringing them together, explains Khim. Brilliant.org is hoping to be the community where these individuals (both young and old) come together to challenge themselves, find like-minded talent, and find opportunities to use their skills. Khim says the inspiration for Brilliant came in the realization that the current model to find technical talent who will become leaders in science, medicine and technology is broken. In many countries, high school students are encouraged to focus on studying for one national exam, which will determine where they go to college. In university, these students are measured on rote learning skills that are irrelevant to how they will be using skills to solve real problems. “There is a mismatch between nurturing intellectual skills in top students versus what they actually have to spend time on to be successful in the system,” she says. But unfortunately, she explains, there is no way to get noticed if you don’t succeed in this system. So Khim decided to create a place where these students can succeed, challenge themselves and realize their true potential. She has enlisted a number of math professors, scientists and other technical minds to create difficult problems on the site. 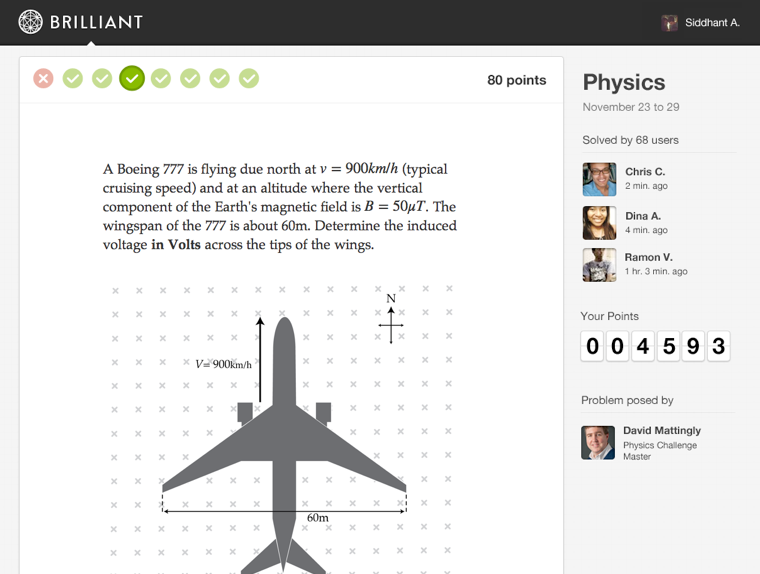 Brilliant features weekly Olympic-style challenges that offer rigorous problem sets in math and physics. Users can not only solve problems but share their solutions and their processes in solving the sets. In March of this year, Khim presented Brilliant at the Launch Festival and caught the eye of investor and Social+Capital founder Chamath Palihapitiya. Palihapitiya has been particularly focused on investing in some of the disruptions around education and saw huge potential in what Khim was trying to do. Although the site only had a few thousand users at the time, Palihapitiya told Khim that he believed Brilliant could one day have millions. He, along with Kapor Capital, 500 Startups, Learn Capital, RTA Capital, and Hyde Park Angels, seeded Brilliant to help scale the site. After less than a year, Brilliant has 100,000 users from 135 countries and is doubling users every two months. Khim thinks that the site could hit 1 million users within a year. Users range from 13 years of age to the elderly. When a student arrives on the site, he or she takes a brief diagnostic exam that will assign a level of mathematical or problem solving skill (1-5). Each week, the student will gain access to problem sets tailored to their abilities and designed to be more challenging and interesting than problems they would get in school. Students get three chances to arrive at the correct answer to each question in a problem set. When they solve problems, they receive points that can be traded in for academic opportunities and other prizes. If the student performs well in their current level for two weeks in a row, Brilliant will bump them to the next level. As Khim explains, at first Brilliant started employing professionals to develop challenging problems in physics and math, but now, more and more content is being user-generated, and professors and technical minds are actually enjoying creating the problems to see if anyone can solve them. For example, Brilliant is currently running a theory programming tournament called Hunger Games. Users write an algorithm to fight to the death (online of course) against other algorithms. In terms of the competition, there are many problem-solving websites and competitions (Art of Problem Solving, Project Euler, TopCoder, Kaggle, IXL, Peking online judge and other online judge sites, etc. ), but not a lot of very active problem-solving communities. Reddit, Quora, Stack Overflow, and other forum-based sites all have math/science communities, but these sites are built for a different purpose. Khim sees her closest analogues as offline math clubs, competitions, and science clubs. Khim is onto something. Beyond the story of Wu, there are already many more who are similar that Brilliant is helping find and provide opportunity to brilliant minds who may have otherwise gone unnoticed. As she says, these are the minds that will be solving major problems in the areas of finance, science and medicine for our world. As for Wu, it’s unclear what his journey would have been if he had not been noticed by Brilliant, Khim and her team. He’s now doing graduate-level mathematics work with the professor in weekly Google Hangouts and plans to come to the U.S. to attend college in a few years. He has ambitions of becoming an investment banker, but who knows which research institution or university or technology giant might beat Goldman Sachs to the punch.